All games will be played under current NCAA basketball rules, except when modified by Los Angeles Hoopz, LLC lead officials and the league commissioner. Two (2) full timeouts and one (1) twenty second time out per half. Time outs do not carry over. Defensive three seconds- The first violation will be a warning. Any further violations, the team is awarded one shot and the ball. No foul out rule! Each player gets up to 6 fouls. Every foul after 6, the opposing team gets (1) technical shot and the ball. Two penalty shots on the team’s fifth foul or second team foul in the final two minutes of the quarter. In the last two minutes of the fourth quarter or overtime, after calling a timeout prior to advancing the ball on a throw-in or rebound, a team may advance the ball to their frontcourt. Unsportsmanlike violations are a one shot technical foul. Fourth quarter, the game clock will stop on every made basket in the last two minutes. Game clock will not start until the ball is touched on inbound pass. The game will start with any five players that are on a team roster or newly acquired free agent players. If there is no shot clock, we will use NCAA Division I Men’s Basketball Rule of “Closely Guarded”. Sudden death, first team to score five (5) points wins. One (1) regular time out and one (1) twenty (20) second (If still available). Team fouls and penalty will carryover from the fourth quarter. No game clock. Only the 24 second clock will run. Upon registration the league rosters are subject to change. The final rosters must be set by week three (3) of an eight game season and approved by the league administrator. No changes thereafter without the approval from the league administrator. A minimum of six players and a maximum of ten players are allowed per team. Teams will not participate until the roster criteria have been met and approved by the league administrator. If there is any threat of bad weather to the point that traveling is hazardous to the players and/or Hoopz staff, the game will be cancelled. Following its cancellation all players and staffing members will be notified via email to the extent of why and if a rescheduled game will be played. In any case go to www.losangeleshoopz.com for up-to-date information pertaining to game cancellation due to inclement weather. All players must have paid their due fees prior to competing. For those signing up in late season, a pro-rated fee will be accessed before competition. 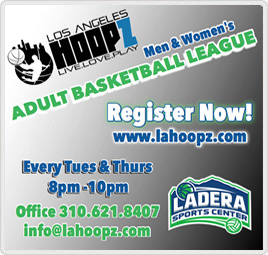 Each player must register via the league website, www.losangeleshoopz.com, to ensure all eligibilities have been met prior to competition. To be eligible for playoff competition, each player must participate in a minimum of four games. Playoff seeding will be determined by league officials. Also players may play on no more than one team provided the following requirements are met: 1) play must occur in different divisions, 2) players must meet the eligibility requirements of each division, and 3) players must be listed on both team rosters as a player. Note: Game schedules will not be changed to accommodate player’s personal schedules. Jersey’s will be provided by the league, provided that all fees have been met by the player. Therefore, only league jerseys may be worn during the game to help distinguish teams. Shorts may also be ordered as an additional cost to the player upon registering. Teams must adhere to the home and visitors rule for uniforms. Players without the proper attire will not be allowed to compete until the uniform requirement has been met. The following is a summary of the violations that may be accessed to a team violation these terms: 1) Two technical shot will be given to the opposing team per uniform violation. 2) Written or tapped numbers will not be allowed and are not considered to be part of the uniform and subject to penalty. Two twenty minute halves will be played per competition. Included is a three minute intermission per contest. The last two (2) minutes of the second half will only have clock stoppage for a dead ball situation. This only applies to teams that are within ten (10) points of each other. The blow out rule is forbidden. Each team will continue to play until the final buzzer has sounded. The clock will only stop for a called timeout by the official for a team, injury or official’s timeout. Each team will be given three full two-minute timeouts per half. These may be used at anytime during the games duration. Timeouts may only be used by players on the floor or bench. Ejected players may not call a timeout under no circumstances. No penalty will be accessed for timeouts called if none are available. Timeouts cannot be carried over to over time periods. First two, overtime periods shall be five (5) minutes in length using regulation stop-clock. One (1) time-out per team per overtime period, this will not include the regulation time outs. Third overtime period shall be sudden death (first team to score shall win). No additional time-outs allowed and game is over. Dunking is NOT permitted at any time in any school or community center gym. This applies to pre-game warm-up, games, half-time, or post-game. Penalty: Two technical fouls, thus resulting in ejection for remainder of game. Note: Ejection fee must be paid to be eligible for reinstatement into the league. Substitutions must be made at the scorekeeper’s table. Only the official will allow player entrance into the game. Penalty: Two (2) technical foul shots awarded to the opposing team, if rule is broken by the in fractioning team. Season – Only players that notify the league of substitutions will be allowed to participate. This must be done within 24 hours of the scheduled tip-off time to warrant eligibility for competition. Playoffs – Only players that have played 50% of the season or have been granted clearance to participate will be eligible for the Playoffs. No exceptions! Team have eight (8) seconds to advance the ball past half court. Violation of the eight (8) second rule will result in forfeit of the basketball, following the referee standing count. No shot clock is currently used as of Jan/2011. Each division will be handled separately and during InterLeague play teams will be allowed six (6) personal fouls. Play will resume upon the shooter’s releasing the basketball. Any lane violation prior to the ball’s destination will result in a lane violation. A lane violation will be accessed to the player and the result is the officials call. Technical fouls accessed to players will result in two (2) free throws plus ball possession to the opposing team. UNSPORTSMANLIKE BEHAVIOR IS INTOLERABLE AND AN AUTOMATIC EJECTION IS WARRANTED. Penalty: Any player having two (2) technical in a game will be disqualified from competition. All season the technical fouls will be calculated. Note: Play will stop and a loss by forfeit given to any team receiving five (5) technical fouls in a given game. Note: Players penalized for dunking at any time will be assessed a technical foul and calculated as mentioned in section B.
Playoff round games will follow the King Replay. The rule becomes effective with two minutes remaining in the second half or overtime of a playoff contest only. Teams must be within ten (10) points, in addition. Subjective calls or second review will result in the King Replay. This can come from either the scores table or the presiding referee(s). There must be clear, conclusive evidence to reverse the call on video; excluding fouls. This rule is effective for the competitive division only! Winner moves on to next round with single elimination in the first and second round; best of three for the Hoopz Finals. Note: This may be expanded to ten teams, where applicable. The winner of the play-in will be awarded the highest seed in the playoff format. Section A. Players must play in fifty percent (50%) of your teams divisional games for the season. Also if a player has not fulfilled their reinstatement application prior to the start of the playoffs, they will not be eligible for the remaining games of the post season. Note: No grievance will be given prior under no circumstance if the reinstatement forms are incomplete. Section B. The number of games within a season will be used to determine eligible playoff teams. Teams that join late or become ineligible will follow the same calculation. The above formula states that the team with the best record will be eligible based on the overall number of games for the season. Note: The calculation based on the length of season. The team with the best win percentage will earn birth using the total number of games as denominator. Note: Forfeited games won by a team are excluded, and only the averages from the above format will be used. Section B. Team with the highest head-to-head win percentage earns the playoff birth. However, if no head-to-head matchup exists the team with the best strength of schedule will earn birth or other tangible formula as defined. A game must consist of at least four (4) players per team to be considered a contest. Therefore, if the minimum amounts of players on the registered team are unavailable, a forfeit will be instituted to the team with insufficient players. Also the scorekeeper has the right to issue the NO GRACE PERIOD, if teams are unresponsive. Note: The second forfeit will earn a fine of $50 paid before the next game. The third forfeit will earn automatic withdrawal from the league, without leagues fees refunded. Note: Forfeited games will not be accounted for in the scorebooks nor officiated. This time will be allocated to the registered players as practice time until the next scheduled game. A player ejected from a game WILL PAY a fine of $50 to the league, before the next scheduled game following multiple violations. Ejected players have an opportunity to appeal the game decision by filling out a protest form. This process will include the ejection fine and paperwork. League officials will review the appeal and determine the outcome accordingly. Note: Players ejected twice in one season will have a one year suspension from the league without league fees refunded. Note: Any player intentionally striking, attempting to strike, or in any way causing bodily harm to other players, spectators, officials, or gym supervisors, shall be suspended for a minimum of one year. Any player expelled from Los Angeles Hoopz because of this rule must submit a letter to the league requesting reinstatement and submit a non-refundable $100 fee. Spectators within the gym premises will be subject to ejection from the facility. Referee will decide on their future availability. An organization, team or player declaring a protest must do so the time the incident occurs and notify the scorekeeper. The scorekeeper will make a note of the protest on the score card that a protest form will be submitted to the league officials. He/She will include a brief description of the situation on the score card and submit it to the league official office. The league official will review the protest form by the next business day or the next scheduled game. The league official will notify the individual(s) the results and all decisions are final. No alternate form or petition will be allowed to void or nullify the protest final decision. Note: Judgment calls made by an official cannot be protested. Note: If a protest presented at the end of any playoff game, the league official will review the documentation before the next game. Note: Protests are not retroactive and can only be applied to the situation in question. A protest form must be submitted for each declaration announced. All teams will receive a five (5) minute grace period after their scheduled contest. Teams/Players that arrive after this time, the presiding referee will decide on the contest. See the Forfeit section for additional details. The scorers table will have ultimate decision. Each team member is responsible for the conduct of their players, spectators and/or visitors before, during and after all scheduled games. Also the team representatives are responsible for keeping their bench areas clean before, during and after all games. When games are finished each team member is too leave the facility in an orderly manner. The conduct each team member, player, and visitor displays is a representation of Los Angeles Hoopz, LLC and we are to make this a fun and enjoyable experience for all those involved. Therefore, every effort will be made to ensure everyone understands their responsibility as a member at Los Angeles Hoopz. Any postponed game will be rescheduled for a later date. No team will play a back-to-back game. However, teams may be scheduled for multiple games within any given day. Rescheduled games are not for any forfeited game. Rescheduled games will not in any manner affect the playoff seeds. Therefore, it is everyone responsibility to make sure games are not rescheduled for any peculiar situation. Also the league office reserves the right to schedule or reschedule games for any night of the week.